I have just started a new animation project using a computer program called Animation:Master. I first used this program way back in 1994 and last used it in 1998. That was three computers ago and my animation from that time has found its way to computer heaven never to be seen again. I was inspired to install the program on my present computer following a recent visit to the Martin Hash’s Animaton:Master web site. I was pleased to see that not only was the program still available but it has grown in scope over the intervening years. 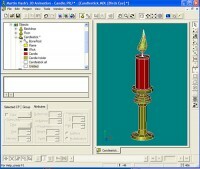 I am using a version that I purchased in 1997 so it does not have anywhere near as many functions as today’s program but the basic modelling and animation functions are there. The recommended operating system for my copy of Amimation:Master is Windows 95 and NT so I was pleasantly surprised to find that it works on Windows XP. Just to be sure I have set it to run in “compatibility mode” for Windows 95. Having got the program running I decided to do a bit of character modelling. That is when I realised that in my twelve year absence I had forgotten what buttons and keys to press to get things working, so it was just like starting over. There is an old saying that if all else fails read the instruction manual. It starts with a simple exercise of building a candle so that is where I began. 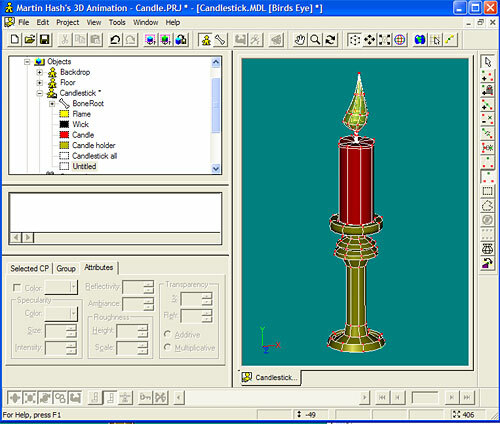 The modelling tools are similar in operation to a vector drawing program such as CorelDraw. You add lines by clicking the start and end points, building up the shape with multiple points. Then comes the clever bit, when you have your basic outline you click on a “lathe” button and it turns your outline into a 3D shape. 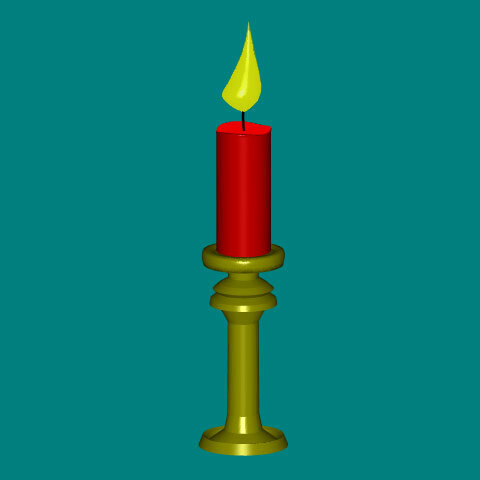 The candlestick has four separate components; the candle holder, the candle, the wick and the flame. As you create the parts you can add colour by selecting from a pallet. You can also add surface attributes such as shininess, called ‘specularity’ in the program and brightness, called ‘ambiance’. Candle exercise. The final render. At any point you can do a final render to see the finished version. One difference I noticed from the computer that I was using twelve years ago is the speed of the final render. The picture of my simple candle model appeared almost instantly whereas it used to take several seconds. This little test run has inspired me to carry on learning the program so I will keep you posted on how I get on. If you have tried computer animation then let us have your thoughts in a comment to this post. Note: click on the pictures to see a larger version.